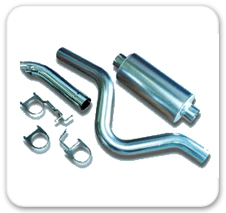 Did you know that the main cause of failed mufflers is simply a broken clamp? And that the cost of a clamp amounts to pocket change? If you're aware of this, chances are you already deal with us, because at AAA Kavtech Inc. we believe an informed customer is a contented customer. We like to help take the mystery out of automotive repairs. Our clients really appreciate that. Besides, explaining about all of the "little extras" we provide is good for business.